In light of recent press, it's topical to talk about our experience with GetSwift (GSW) over the past 15 months. In December 2016 we invested a small amount of the Fund (around 1.5%) into the GSW IPO at 20c. We were attracted to the small market cap ($25m at IPO), the modest but growing revenue streams and the attractive thematic of a last-mile logistics software platform. Within three months GSW had run to 50c (with which we were obviously thrilled), but we were starting to question the valuation. We sold a few shares as the stock continued to move higher. Tail-winded by a cavalcade of announced contract wins, by July 2017 GSW had doubled again to $1 at which point it conducted a $24m capital raising (to which we did not subscribe). "...inconsistencies in management rhetoric, growing competition, lack of commercialisation traction and (recently) extreme valuation concerns (a fully diluted market cap of $180m, versus revenues of $54k in the first quarter of 2017) have led us to take our profits in GSW in the new financial year. " In the following 5 months, ballooned by yet more contract wins (including Amazon!) to our disbelief and annoyance - even though we try very hard not to focus on stocks in which we've divested - GSW quadrupled from our sale price of $1.07 to over $4. However earlier this year, AFR articles highlighting GSW's lack of commercial success (a number of previously announced contracts never surpassed trial stage and the company did not inform the market) prompted the stock's 85% nose-dive from its heights and it is now trading well below our last sale price. With a number of class actions against the company for misleading and deceptive conduct, we see little chance of the Cyan C3G Fund returning to the register. One should be cautious when an executive of a newly listed business suddenly appears on the AFR's Young Rich List. 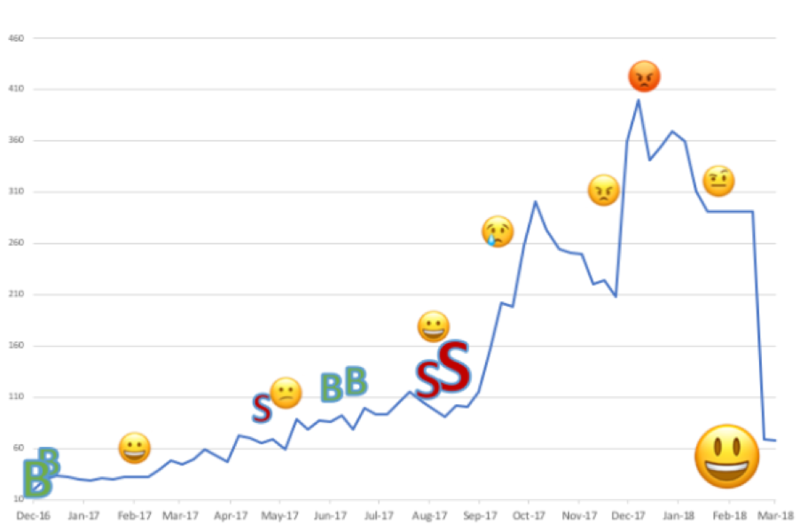 GetSwift - Cyan's buys, sells and mood swings.